Here are some photos of the cabin (aka Firehouse Moustache Wax Central) during a rare Mississippi snow, and a couple photos in warmer weather. 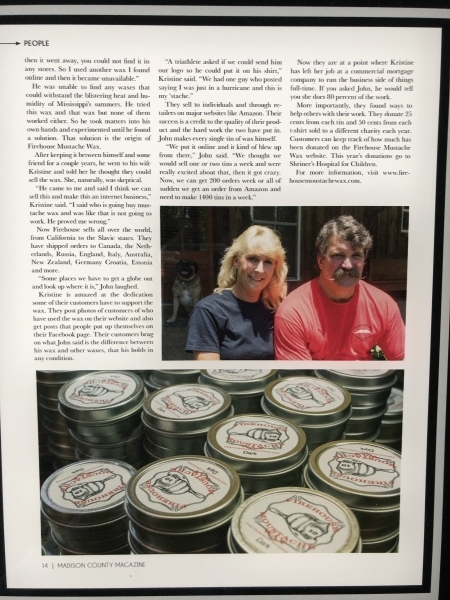 John is a firefighter by trade as well as a farrier (horseshoer) on his days off from the station, in addition to the time consuming wax making. He formulated the wax after 2 different waxes he used were no longer available and he just couldn't find anything comparable that worked. 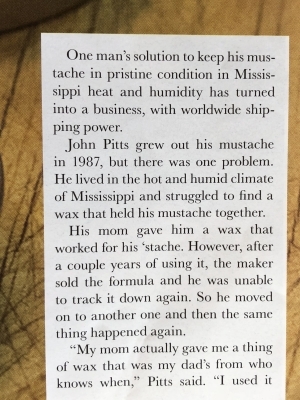 He decided maybe he could make his own wax to withstand the heat and humidity in Mississippi as well as the damp and cold. 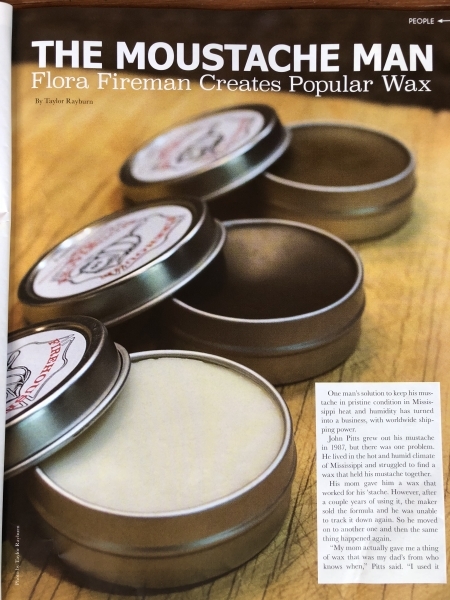 After many trial and error batches, he came up with the formulations of Firehouse Moustache Wax. Many of the guys at the fire station also got in on the fun and experimentation. 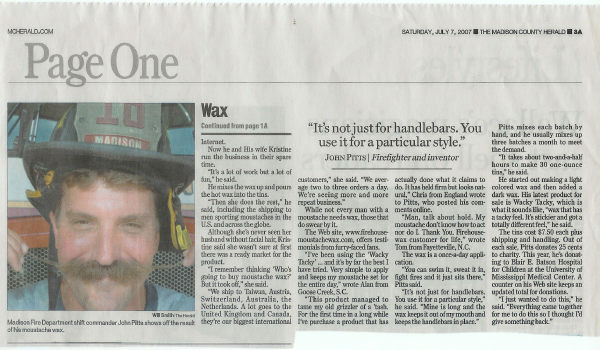 In addition to John using it, he shared his wax with friends/co-workers and family who all thought it was great. He then stated to his wife back in 2006, "I think I'll try to market this on the internet." She nonchalantly told him, "Sure, if you want to" while thinking, "Who in the world is going to buy moustache wax??" Well, she ate those words as they now sell all over the world and, for a small 'mom and pop' business, continue to grow. As a side note, his wife has never been particularly fond of his moustache and has never seen him without it since they first met in 1990. 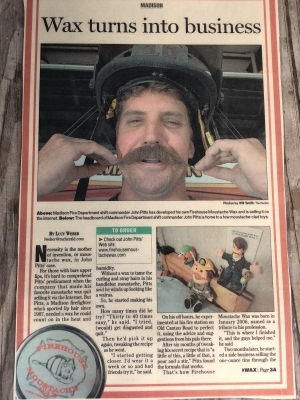 He's had his 'stache since 1987. To John’s satisfaction and her dismay, she now can't say anything about his 'stache, particularly since she's running the business end! We are pleased to announce that our 2019 Charity of the Year will be Heroes and Horses. I happened to find out about this worthy organization while perusing You Tube. I saw their video called 500 Miles and was impressed and intrigued. I wanted to further expose the good work they're doing after watching 500 Miles and another video from National Geographic about how Heroes & Horses helped an Army Veteran find healing in Yellowstone. With being a "horse person" my whole life as well as a farrier, plus the respect I have for all our veterans and what they've done, it was an easy decision choosing Heroes and Horses as our charity this year. Please keep our veterans and those currently serving in your prayers. Thanks for purchasing our product and further helping their worthy cause. Heroes and Horses was created from a Navy Seal's mission to help other combat veterans find their new purpose. Heroes and Horses provides extreme expedition-style horse pack trips that teach self-reliance, teamwork and perseverance. Experienced instructors, many who are combat veterans themselves, lead teams of veterans and their pack animals into the wilderness on epic, life-changing journeys of discovery.